Weighty Matters: Why Would a Hospital Serve Poutine? One of the things I've learned from writing this blog is that make enough noise and have a strong enough case and you'll be amazed what can come of it. Today I've got an example of a young new doc, using his voice. Dr. Rob Stevenson, a cardiology resident at Dalhousie, recently wrote a column for the Chronicle Herald detailing his experiences with his hospital's cafeteria. The QE II hospital's cafeteria had been featured in the news as students from a local school who had outlawed junk food, started showing up in the nearby hospital's cafeteria to eat the now comparatively junkier hospital food. In fact that picture up above was taken by Rob and shows a group of cardiologists and nurses heading over to the high school to see their healthy fare and a group of students heading out to the hospital cafeteria to get their french fry fix. The QE II, in response to the bad press, apparently came out to state that cafeteria customers were adults, "who can make their own decisions" and that there were some, "healthy choices at point of sale". "The customers of the QE II cafeterias are often patients and their families, in addition to many of my fellow workers at the hospital. The food is often consumed during the most stressful of times, and throughout long days, and nights in-house." And about those healthy choices? "I have been mostly aware of chips, cookies, doughnuts and chocolate bars – hardly a lasting image of sound nutrition." The QE II has hemmed and hawed that changes will be coming sooner rather than later, but Dr. Stevenson wonders, why wait? "Every day is the perfect day to stop serving fries and doughnuts. Every day is the perfect day for a health care institution to lead by healthy example." "On a daily basis, we physicians make recommendations to patients regarding lifestyle, and every day we battle with the poor food choices offered by vendors within the hospital. Why would any fried food (yes, doughnuts are fried) ever be available in a health care facility? Why would a hospital serve poutine? Kudos to Dr. Stevenson - I wish there were more docs like him willing to use their voices. Let's hope his noise affects change. Stay tuned over the course of the next few weeks for more hospital cafeteria woes as I take you on a guided tour of Ottawa's offerings (hint, they're not any better). 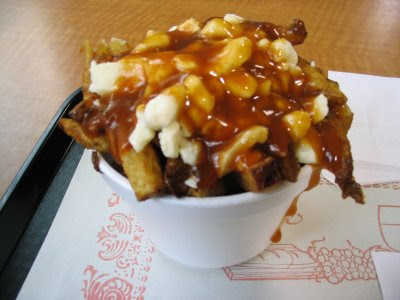 UPDATE: For my international friends and readers who don't know what poutine is, it's french fries, smothered in cheese curds, smothered in gravy. Here's a representative picture.